We develop an extension of the basic inverse seesaw model which addresses simultaneously two of its drawbacks, namely, the lack of explanation of the tiny Majorana mass term μ for the TeV-scale singlet fermions and the difficulty in achieving successful leptogenesis. Firstly, we investigate systematically leptogenesis within the inverse (and the related linear) seesaw models and show that a successful scenario requires either small Yukawa couplings, implying loss of experimental signals, and/or quasi-degeneracy among singlets mass of different generations, suggesting extra structure must be invoked. Then we move to the analysis of our new framework, which we refer to as hybrid seesaw. This combines the TeV degrees of freedom of the inverse seesaw with those of a high-scale (MN ≫ TeV) seesaw module in such a way as to retain the main features of both pictures: naturally small neutrino masses, successful leptogenesis, and accessible experimental signatures. We show how the required structure can arise from a more fundamental theory with a gauge symmetry or from warped extra dimensions/composite Higgs. We provide a detailed derivation of all the analytical formulae necessary to analyze leptogenesis in this new framework, and discuss the entire gamut of possibilities our scenario encompasses — including scenarios with singlet masses in the enlarged range MN ∼ 106 − 1016 GeV. This idea of hybrid seesaw was proposed by us in arXiv:1804.06847; here, we substantially elaborate upon and extend earlier results. P. Minkowski, μ → eγ at a Rate of One Out of 109 Muon Decays?, Phys. Lett. 67B (1977) 421 [INSPIRE]. M. Malinsky, J.C. Romao and J.W.F. Valle, Novel supersymmetric SO(10) seesaw mechanism, Phys. Rev. Lett. 95 (2005) 161801 [hep-ph/0506296] [INSPIRE]. M. Aoki, N. Haba and R. Takahashi, A model realizing inverse seesaw and resonant leptogenesis, PTEP 2015 (2015) 113B03 [arXiv:1506.06946] [INSPIRE]. S.J. Huber and Q. Shafi, Seesaw mechanism in warped geometry, Phys. Lett. B 583 (2004) 293 [hep-ph/0309252] [INSPIRE]. C. Csáki, C. Grojean, J. Hubisz, Y. Shirman and J. Terning, Fermions on an interval: Quark and lepton masses without a Higgs, Phys. Rev. D 70 (2004) 015012 [hep-ph/0310355] [INSPIRE]. T.P. Cheng and L.-F. Li, μ → eγ in Theories With Dirac and Majorana Neutrino Mass Terms, Phys. Rev. Lett. 45 (1980) 1908 [INSPIRE]. MEG collaboration, Search for the lepton flavour violating decay μ + → e+ γ with the full dataset of the MEG experiment, Eur. Phys. J. C 76 (2016) 434 [arXiv:1605.05081] [INSPIRE]. E. Nardi, Y. Nir, E. Roulet and J. Racker, The importance of flavor in leptogenesis, JHEP 01 (2006) 164 [hep-ph/0601084] [INSPIRE]. A. Abada, S. Davidson, F.-X. Josse-Michaux, M. Losada and A. Riotto, Flavor issues in leptogenesis, JCAP 04 (2006) 004 [hep-ph/0601083] [INSPIRE]. A. Abada, S. Davidson, A. Ibarra, F.X. Josse-Michaux, M. Losada and A. Riotto, Flavour Matters in Leptogenesis, JHEP 09 (2006) 010 [hep-ph/0605281] [INSPIRE]. L. Covi, E. Roulet and F. Vissani, CP violating decays in leptogenesis scenarios, Phys. Lett. B 384 (1996) 169 [hep-ph/9605319] [INSPIRE]. Planck collaboration, Planck 2015 results. XIII. Cosmological parameters, Astron. Astrophys. 594 (2016) A13 [arXiv:1502.01589] [INSPIRE]. R. Adhikari and R. Rangarajan, Baryon number violation in particle decays, Phys. Rev. D 65 (2002) 083504 [hep-ph/0110387] [INSPIRE]. A. Pilaftsis and T.E.J. Underwood, Resonant leptogenesis, Nucl. Phys. B 692 (2004) 303 [hep-ph/0309342] [INSPIRE]. A. Pilaftsis, Resonant τ leptogenesis with observable lepton number violation, Phys. Rev. Lett. 95 (2005) 081602 [hep-ph/0408103] [INSPIRE]. A. Pilaftsis and T.E.J. Underwood, Electroweak-scale resonant leptogenesis, Phys. Rev. D 72 (2005) 113001 [hep-ph/0506107] [INSPIRE]. M.J. Dolan, T.P. Dutka and R.R. Volkas, Low-scale Leptogenesis with Minimal Lepton Flavour Violation, arXiv:1812.11964 [INSPIRE]. E.K. Akhmedov, V.A. Rubakov and A. Yu. Smirnov, Baryogenesis via neutrino oscillations, Phys. Rev. Lett. 81 (1998) 1359 [hep-ph/9803255] [INSPIRE]. A. Antaramian, L.J. Hall and A. Rasin, Hypercharge and the cosmological baryon asymmetry, Phys. Rev. D 49 (1994) 3881 [hep-ph/9311279] [INSPIRE]. G. ’t Hooft, Symmetry Breaking Through Bell-Jackiw Anomalies, Phys. Rev. Lett. 37 (1976) 8 [INSPIRE]. G. ’t Hooft, Computation of the Quantum Effects Due to a Four-Dimensional Pseudoparticle, Phys. Rev. D 14 (1976) 3432 [Erratum ibid. D 18 (1978) 2199] [INSPIRE]. T. Inui, T. Ichihara, Y. Mimura and N. Sakai, Cosmological baryon asymmetry in supersymmetric Standard Models and heavy particle effects, Phys. Lett. B 325 (1994) 392 [hep-ph/9310268] [INSPIRE]. K. Enqvist and J. Sirkka, Chemical equilibrium in QCD gas in the early universe, Phys. Lett. B 314 (1993) 298 [hep-ph/9304273] [INSPIRE]. BICEP2 and Planck collaborations, Joint Analysis of BICEP2/Keck Array and Planck Data, Phys. Rev. Lett. 114 (2015) 101301 [arXiv:1502.00612] [INSPIRE]. E.W. Kolb and S. Wolfram, Baryon Number Generation in the Early Universe, Nucl. Phys. B 172 (1980) 224 [Erratum ibid. B 195 (1982) 542] [INSPIRE]. W. Buchmüller and M. Plümacher, Spectator processes and baryogenesis, Phys. Lett. B 511 (2001) 74 [hep-ph/0104189] [INSPIRE]. 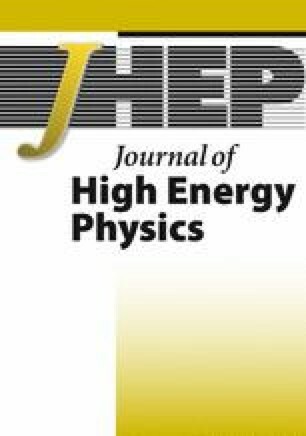 E. Nardi, Y. Nir, J. Racker and E. Roulet, On Higgs and sphaleron effects during the leptogenesis era, JHEP 01 (2006) 068 [hep-ph/0512052] [INSPIRE]. W. Buchmüller, P. Di Bari and M. Plümacher, Leptogenesis for pedestrians, Annals Phys. 315 (2005) 305 [hep-ph/0401240] [INSPIRE]. P. Batra, B.A. Dobrescu and D. Spivak, Anomaly-free sets of fermions, J. Math. Phys. 47 (2006) 082301 [hep-ph/0510181] [INSPIRE]. 1.Maryland Center for Fundamental Physics, Department of PhysicsUniversity of MarylandCollege ParkU.S.A. 3.Department of Physics, LEPPCornell UniversityIthacaU.S.A.